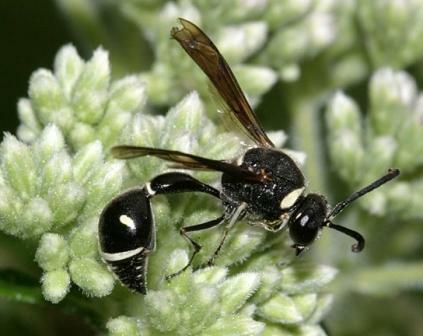 Region: This wasp can be found in eastern US, west to Texas, Oklahoma, Kansas, Nebraska, Minnesota; Ontario. Life cycle: The queens, after mating,hibernate in bark forming new colonies each spring. These new populations disperse in the fall. Physical description: There are many species of narrow-waisted solitary wasps that live in Kentucky and the this wasp is one of them. Most solitary wasps are ant-like in appearance, with narrow waists and thread-like antennae. The Wasp is 3/4" long with black and yellow markings. As in the case of other vespid wasps, the egg is placed in the cell, attached to the roof or wall, before the cell is filled with insects. Feeding characteristic: The nest is stored with paralyzed Cankerworms and other insects. They build nests or burrows in which they lay eggs, and within this burrow, the wasp encloses an insect or spider that has been stung and paralyzed. When hatched, the wasp larvae feed on the paralyzed prey.